What’s Good: The comic relief that a brief character of Kunal Roy Kapur brings into an otherwise traumatizing film. What’s Bad: It would be difficult to start counting that as not only does the screenplay go haywire, but an unbearable soundtrack makes it extremely difficult to watch this film. Loo break: Take as long as you can! Vishi is a local goon who basically likes beating up people to get his work done but is nonetheless a kind-hearted person. On the other hand Khushi is an extremely clumsy girl who keeps losing her chances with destiny and gets suddenly lucky after she accidentally meets Vishi. Amidst the building chemistry between Khushi and Vishi, local cops and an international don named Xavier are on the look-out for AJ aka Jai who is a look alike of Vishi and is in the same city. The story takes a major turn of events when both AJ and Vishi come face to face. Will AJ’s past create problems for Vishi’s future? After watching the first thirty minutes of this film, I was thoroughly confused as to why would a sane, working woman (Khushi) run-around a local goon (Vishi) to see him naked just so that she can get her luck fixed. Confused? Well, yeah that is exactly what the story of this film does to you. With a fickle character build up, the protagonists are too sketchy and almost nothing believable comes through, not even the love angle. It is tiring to watch cliched suited-up Bangkok villains who have hulks as their right-hands and seem to have ‘killing with all possible weapons’ as a qualification on their CVs. Larger than life concepts spoil this story which could have at least managed to be a typical ‘Bollywood action drama’. A major disappointment for me was the fact that while I was impressed by the punchlines in the film’s trailer, they fall flat in the film since they pop up in rare scenes and the otherwise running script is overtly bland to elevate them. Also it was disturbing to see the amount of violence shown towards women in the film. In my opinion, scenes of kicking or punching a woman in the face must certainly be excluded from the film. Ajay Devgn is a huge disappointment in this film. The otherwise brilliant actor seems too volatile in this role. Though he excels in the scenes which have action, the actor does not seem comfortable pulling off the comic undertones and it would be best left unsaid for the parts that he tries the ‘Prabhudheva’ style dancing. This is Sonakshi Sinha’s third film with the director and sadly she shows no growth whatsoever. The actress essays her usual self and nothing extraordinary to it. Yami Gautam looks radiant in every frame that she is a part of. Debutante Manasvi Mamgai reveals quite a lot with her negative character. But her acting is extremely weak and it would be safe to say that you would find her heaving much more than speaking in the film. Unfortunately, this is the second time Prabhudheva fails me after his 2014 film Ramaiya Vastavaiya which was a flop. Even though I was hoping him to step up and make Action Jackson a second or an even better Rowdy Rathore, it couldn’t come even a second close. He adds all his usual ingredients of action, comedy and Sonakshi Sinha but this time the recipe failed big time. If only the story was a little stronger, the film would have been worth a watch but when topped with its pathetic background score, even minutes turn to hours. The absurdity with which the songs have been included in the film is shocking. Gravity defying action sequences are a staple in his films and that is constant here too. There is a lot of play with lighting but is quite disturbing to see every action scene in a gloomy and rainy setting. The film is a drag for over two hours and that certainly talks quite a bit about the editing department. Action Jackson matches up to neither Prabhudheva’s film making nor an Ajay Devgn film. It is an extreme downer for those expecting a full on action-packed ‘masala’ film. With a done to death plot and an absolutely nothing new to offer, the only thing that this film latches onto is Ajay Devgn who maintains his swagger well enough. I am going with a 1.5/5 for Action Jackson. 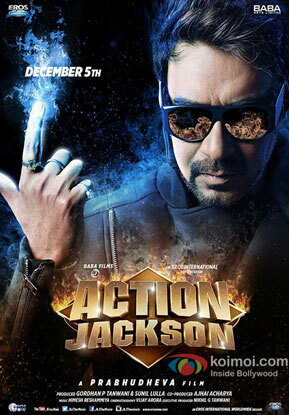 Action Jackson releases on 5th December, 2014. Share with us your experience of watching Action Jackson. Crap review foolish reviewer.khans kaa kuttaa.this movie is going to cross 150 cr.you just wait and watch.you had given 2 stars to hell boring hny.prabhu dheva is the king of masala pot boilers.the audience is going to enjoy this movie like they did wanted rowdy etc.your crappy review doesnot make any difference to the audience .better leave criticism of all other stars in bollywood.you are nothing but publicity agent of khans. Worng review. .. I really enjoy the movie and its really nice to watch .. I rate 4 out of 5 . Stop reviewing u don’t worth it. Surabhi Redkar, being paid by srk, has given worse comment with 1.5 star only. I can guess why, ajay, on his last interview, had said the monopoly of booking the screen counts during festivals would be broken soon and the BO figures have to be fair enough since the fake news on these figures let audience and co stars confused. These are the issues why the well paid critics are giving bad comments. As Koimoi gives it a One and Half stars, it will enjoy a good weekends as well. Nice movie. I really enjoy it. don’t write this type of review. If koimoi give 1 or 2 star movie should see and if koimoi give 3 or 4 star dont watch. One of the worst movies i have seen in a long time. Action jackon was non stop torture for 3 hours. ha ha…I never had this much fun reading a movie review……..
prabhudeva is copycat director he can’t make original version only copy. But he is good choreographer. yes this is worst movie. but ajay devgun fans can like it…. Action jackson is mustwatch movie.complete paisa vasool.it if u liked rowdy rathore and ghajni then u will like Action jackson. it dropped on saturday becouse of critics.crtitics have written against it. but it picked up on sunday becouse audances are liking it.it is fantastic movie.better than happy new year. if u liked rowdy rothore and ghajni u will like it for sure. Action jaction is pravudeva fillm .Ajay dewgan is best actoer nd pravudeva is best choreographer .Action jackson is mustwatch movie.complete paisa vasool. I m realy very excited at the end of interval . than after interval I realised as a good and zacass film. bhai moive to thikk h but jitani umeed thi vesi nhi nikali thoda over action ho gya PRABHU JEE vese good luck for next effort. Don’t knw why sóme people putting negative comments for this movie. Dnt knw why peoples having problem for Ajay Devgan Sir. You first jst watch this film. I seened it Twice. Its a full time Entertainer yaar. In my view, its Better than BANG BANG and Happy NewYear. U jst watch plz. . The film has comedy, action, cute songs with a Strong story. Ya i agree first 20 or 30mints u didnt get the story tale. But 5min before Intervel There is a TWIST. Then u get that tale. Dnt look what me or other’s posting reviews for dis movie. Its jst their personal opiníon only. U jst hear whats ur heart and mind says. So Jst watch dis movie completely. I am sure its a paisa vasul movie. I vl give 9.5/10. this movie is better.Ajay devgan is best performance in this movie so I really like this film. its not matter how much other actors movies earned in box office but this movie better than those. combination of love, action, comedy and entertainment. ajay actually real super hero i like his dialog na cmtmt na apomnt only punsment.